Badger Family. Father Benjamin, Mother Beatrix, Brother Byron & Sister Bess Underwood. 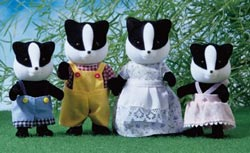 The Badger Family live in the Caravan which is pulled by Bramble the Pony.